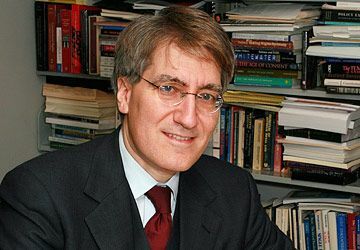 WASHINGTON (CNS) — Robert P. George, a Catholic legal scholar and ethicist who is the McCormick professor of jurisprudence at Princeton University, has been elected to head the U.S. Commission on International Religious Freedom. He was appointed to the bipartisan commission in 2012 by House Speaker John Boehner of Ohio and is serving his first term as a commissioner. George succeeds Katrina Lantos Swett, an appointee of Senate Majority Leader Harry Reid of Nevada. She completed a one-year term as commission chair. The commission is an independent government agency charged with reviewing violations of religious freedom throughout the world and making appropriate policy recommendations to the president, secretary of state and Congress. It was established by the 1998 International Religious Freedom Act. The law also established the Office of International Religious Freedom in the State Department’s Bureau of Democracy, Human Rights and Labor, whose staff monitors religious persecution and discrimination worldwide. George added that he would do his best to live up to Swett’s “outstanding example” as the commission “works to ensure that the cause of religious freedom, understood in its most robust sense, is given the high priority it deserves in the formation and execution of U.S. foreign policy. While much has been accomplished, much remains to be done. He was one of the drafters of 2009’s Manhattan Declaration, a joint statement of more than 140 Christian leaders, including 14 Catholic bishops, who pledged renewed zeal in protecting religious freedom as well as defending the unborn and upholding the traditional definition of marriage between one man and one woman.